From a series on Twitter. Click the image to see more. An emergency is a catastrophic event that can be addressed within the household or by requested assistance from outside the area (first responders - fire, Sheriff's Department, medical or utility personnel). A disaster is a catastrophic event that is significant enough to prohibit or delay immediate response by first responders from outside the area. A disaster is beyond the abilities of a single household and it requires assistance from neighbors. This page is all about preparing to meet a disaster. "Emergency Resource Guide," distributed by the Washington State Department of Health. The "Emergency Preparedness Guide" describes how "one hour of disaster preparedness activity each month helps you be ready for disasters whenever they occur." "Family Emergency Preparedness Plan" booklet. Although printed 10 years ago, this contains a series of checklists you're sure to find useful. 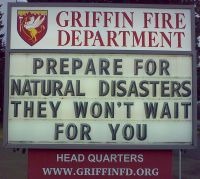 Your purchase of disaster preparedness equipment through Amazon.com can benefit the Griffin Neighborhood Association. The Internet is filled with disaster preparedness resources. The Take Winter By Storm website is a good resource for when you are planning on what you need to assemble to meet your family's needs, either to prepare for a disaster or even one of our typical wintertime power outages. Prepare for yourself and your family, first. Then make a plan with your neighbors. This page on the Washington Military Department's website can help you start with your personal preparedness. For a more local resource than, check out the Thurston County Emergency Management website, too.
" Make A Plan, Build A Kit, Help Each Other." That's what you'll find on the What to Do to Make it Through website, from the Puget Sound Offices of Emergency Management. "Kid's Guide to Building a Disaster Supply Kit." A robust list of supplies and links to other online resources to help in your disaster preparation. It's not just for kids. The web page, Preparing for Disasters in Your Home; What to buy, what to skip, contains a good deal of information on what equipment to assemble to prepare your home for a disaster. One of the items often overlooked in disaster planning is "financial." It is good to have cash in the disaster kit. No less than $100, in small denomination bills. Also, many kits don't include road flares. It's a good idea to have some in the kit (properly contained). What are the important legal documents you should include in your disaster preparedness kit? This web page suggests some disaster planning many people miss. Don't forget to remain familiar with the locations you are storing items such as personal valuables, e.g. jewelry, irreplaceable heirlooms, last will and testaments, passports and other important papers, and so forth. In parts of rural Washington, wildfire is an increasing disaster threat. 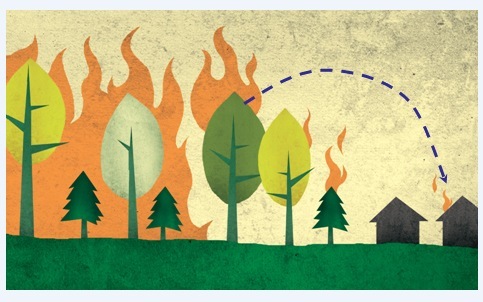 The Firewise website is an excellent resource for residents looking to reduce the risk of property damage in case of wildfire. "The American Red Cross recommends that senior citizens create a personal support network made up of several individuals who will check in on you in an emergency." This is a big reason to plan with your neighbors, for a disaster. This Red Cross web page has more information on the importance of creating a personal support network. Pet owners need to prepare to help their pets weather a disaster, too. This web page from the American Society for the Prevention of Cruelty to Animals can help you to prepare to protect your pets during a disaster. FEMA distributes this "Earthquake Safety Guide for Homeowners." It's introduction reads, in part, "This booklet is a good start to begin strengthening your home against earthquake damage." What are the incidents of flu in the U.S. or in this state? Click here for the CDC's Weekly US Map tracking page. Where did the Google Flu Tracker go? Google has shut it down, although historic data is still available here. Your goal should be to safely survive for seven to ten days with limited or no assistance from outside the immediate area. You can meet this goal if you plan ahead. And, you can more easily meet this goal if you work with your neighbors. In a disaster, your most immediate source of help are the neighbors living around you. The "Map Your Neighborhood" program provides a great start for those people who would like to organize a small number of neighbors to prepare for disaster. Some of the "Map Your Neighborhood" program is more applicable to urban and suburban settings, instead of rural areas such as ours. However, this program has already been successfully implemented in the Griffin area. Click here to view a presentation used by residents along Sunrise Beach Road, to organize a neighborhood disaster preparedness response. Click here for the Map Your Neighborhood web site. There you will find all you need to know to organize a small number of neighbors (probably no more than ten) into a neighborhood MYN Team.